View A.J. LeBlanc Heating's Boiler Installations. A time delay relay is a way to squeeze the most heat out of your system without running the boiler. When the thermostat clicks on, the relay causes the boiler to circulate hot water through the system without turning on the boiler. After a set time, the boiler will fire up. A time delay relay can cut your fuel costs by up to 10%. An aquastat controls the temperature of the hot water in a boiler, typically keeping it around 180°F. When heating needs are lighter in the spring and fall, a modulating aquastat, also called an outdoor reset, senses outdoor temperatures and adjusts the hot water temperature accordingly. The units can save up to 10% on fuel costs. 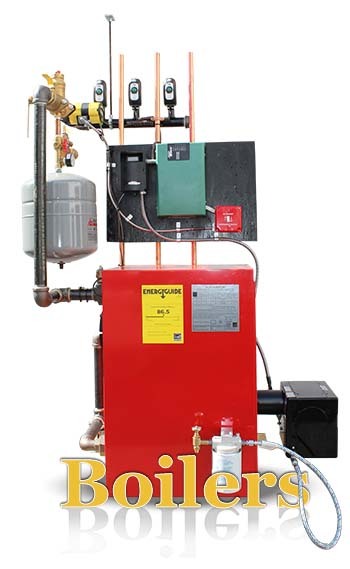 Condensing Combination Gas Boilers are the ideal solution for customers who need both hot water and whole home heat. 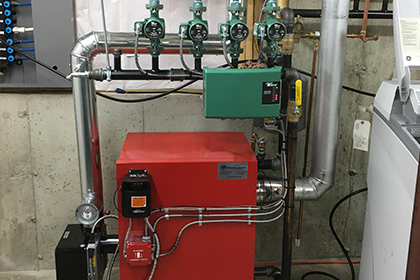 These boilers are capable of producing both within a single compact wall hung design. 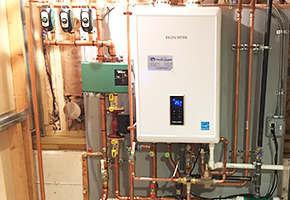 Unlike conventional boilers, a Combination Gas Boiler heats water only when needed, making it as environmentally sound as it is cost effective. 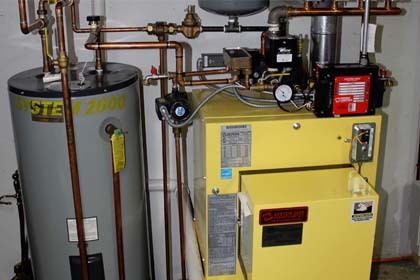 A boiler is a closed vessel in which water or other fluid is heated. A burner running on either natural gas, liquid petroleum or oil acts as the heat source. Heat is then supplied via copper or pex tubing around your home and is released through the process of convection. A boilers efficiency level is dependent upon multiple factors including owner operation, fuel type, venting, regular maintenance, and boiler design (i.e. thermostat & boiler controls). LeBlanc Heating installs and services all types of boilers from traditional to wall-hung combination systems. Some of the major brands we install include but are not limited to Navien, Biasi, System 2000, Buderus, and Burnham. 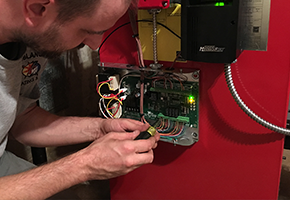 LeBlanc Heating also installs accessories and components such as thermostats, boiler controls, fittings, expansion tanks, control panels, air vents, pressure regulators, backflow devices, pumps, and other products to complete your radiant system. With the Biasi three pass boiler design, and low water content, heat is quickly supplied for your heating zones and hot water needs. It is particularly effective in baseboard and hydro-air coil applications where it achieves fuel savings of up to 40% over conventional single pass boilers. Navien’s new super condensing boilers are extremely efficient and low in NOx emissions. These wall hung Navien boilers are 90% efficient. 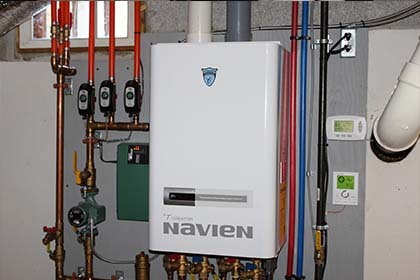 LeBlanc Heating recommends Navien wall hung boilers to customers who value both space savings and efficiency. Call LeBlanc Heating today for a free quote. Hydro air combines both forced hot water (A Boiler System) and forced hot air system components (Air Handler & Air Ducts). Copper tubing supplies hot water over an air handler which blows the air throughout your home's ductwork and into your conditioned spaces. Radiant Heat systems require the installation of pex piping beneath your home's flooring. The piping transfers hot water (radiant energy) throughout the house which heats the flooring. 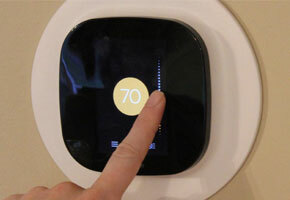 The heat naturally rises from the floor and spreads to the air of the home. The benefit of radiant flooring is the concealed transfer of heat and even distribution. In addition to installation, LeBlanc Heating & Air Conditioning has a 24/7 service team which specializes in the maintenance and repair of forced hot water systems.